We are “Pressing Play” this year! We’re exploring play as a way to live, work, and interact. 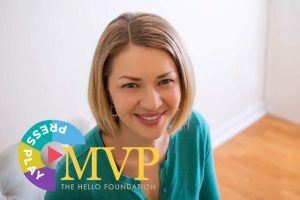 And because we’re inspired by the Hello clinicians playing and working all around us, we’re recognizing a member of our group each quarter as a Most Valuable Player (MVP). This winter, we have chosen Anka Sepulveda as our MVP because of the way she prioritizes play! Anka has been with The Hello Foundation since 2010, serving students across Oregon and Washington through our Hello There model. Since she began with Hello, Anka has made a point of setting aside time for personal and professional interests. She has pursued her interest in transgender voice therapy outside of her school-based placements. An accomplished artist, she finds time to make art and share it on multiple platforms. Anka is a valuable member of our community and contributes in a variety of ways – by participating in events, sharing in and contributing to online discussions, and even taking on the mentorship of a graduate student this winter. Anka models the elusive skills of balancing, prioritizing, and sometimes even combining, work and play. It’s easy to recognize in Anka’s ongoing efforts the kinds of habits that can make us all better at our jobs, happier in our homes, and more comfortable in our own skins. We are challenging ourselves this year to grow and be creative in our work and in our play! Anka, we hope you can find new inspiration, new activities, and new connections with the Koala Crate subscription we’re sending you. Play on!